This is the 400th blog entry. I want to thank everyone who follows my blog, reads, and comments on my blog. You rock! 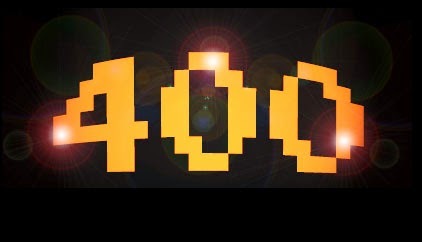 For today’s blog entry, here are some mathematical, and fun facts regarding the number 400. The divisors of 400 are: 1, 2, 4, 5, 8, 10, 16, 20, 25, 40, 50, 80, 100, 200, and 400. The sum of these divisors is 961. 400 is a composite number. The nearest primes to 400 are 397 and 401. Totient function: ϕ(400) = 160. That is, there are 160 positive integers less than 400 that are coprime to 400. That is, the GCD of 400 and such coprime numbers is 1. A square matrix of 400 x 400 has 160,000 elements. A gradian (also symbolized as gon) is an angle measure, splitting a circle in 400 angular units. The gradian is primarily used in civil engineering and surveying in Europe. The Hewlett Packard HP 12C Platinum Edition finance calculator has a programmable memory of 400 steps. Atari released the Atari 400 computer in late 1979. It was an entry-level computer. Specifications include: 1.8 MHz processor, 8K RAM (expandable to 48K), and uses a TV screen a monitor. Resolution of the computer varies, 320 x 192 monochrome to 160 x 96 color screen. The Atari 400 used cartridges to run programs and games. Visible light that has a wavelength of 400 nm (nanometers) has the color of violet. A person who has lived 400 days is of age 1 year, and a little more than 1 month. If you went around the entire board on a Monopoly game 10 times, you would traveled 400 spaces. The card game 400, originated in Lebanon, is a trick taking game between two teams of two players. In 400, players individually make bids to how many tricks they can win. Hearts is the trump suit. There is a German music electronic artist named Kenkraft 400. Chances are if you been to a recent sports event, you have heard “Zombie Nation”. Article: "The HP-12C, 30 Years and Counting" - Richard Nelson and Gene Wright. Published in the HP Solve web-letter, October 2011. This article explains why Hewlett Packard's HP 12C has been a mainstream in the financial calculator market for more than 30 years. The HP 12C was originally released in 1981. Some of the praises of the HP 12C include its long battery life, unclutter keyboard, programming ability, and a good financial function set. In 2003, Hewlett Packard released the Platinum Edition of the HP 12C. Craps: Start by assigning a random seven digit decimal and storing it in [i] and your initial bankroll in [FV]. Each bet is placed in the display before pressing [R/S]. Each dice roll will show tt.xxxx: where tt = total of the dice, xxxx represents the two individual dice. Example: 7.52: you rolled a 7 and the dice showed a 5 and a 2. Dealer/Lotto Routine: This works with sample without replacement. Jive Turkey: Or for you The Price is Right fans, the Clock Game, minus the clock. The score is indicated by the number of guess you needed to get the right number. The secret number is between 0 and 99. Super Bagels: Another guess the number game. Sum of Digits: A number guess game that uses the sum of the digits. Pontoon/Blackjack: Simulate the drawing and strategy of each player. Start by giving a seven-digit seed and storing it in [i]. Press [R/S] to draw new cards. A negative score indicates a bust. Fruit Machine: Slot machine simulator. Lunar Lander: Land a rocket on the Moon - if you can. It is a classic calculator game of the 1970s. Thanks to Jeff Kearns for this suggestion. If you are looking to input an algorithm for Black-Scholes, this article may be what you need. The article is presented by Tony Hutchins, featuring programs by Dr. Peter Carr (UCLA). Amazing what can be done with a financial programming calculator. Here's to at least another 30+ years of the amazing HP 12C. Source: Ball, John A. “Algorithms for RPN Calculators” John Wiley & Sons: 1978. This blog is property of Edward Shore, 2014.